The River & Rowing Museum celebrates the traditions and environment of the River Thames, the international sport of rowing and the historic riverside community of Henley-on-Thames in England. Spacious and state-of-the-art, the specially commissioned building was designed by the award winning British architect, David Chipperfield. The museum was opened in August 1998 and is already an architectural landmark. The museum has won a number of awards including the National Heritage UK Museum of the Year 1999, Building of the Year 1999 for England (shortlisted for the Stirling Prize) and Website of the Week for two weeks running in the 24 Hour Museum UK museums portal. The website has been produced at minimal cost, but is simple and effective in design (matching the minimalist design of the museum building itself) and attracting over 65,000 visitors so far (more than have visited the physical museum). The website is organized in a simple hierarchical manner. The homepage is designed to present the museum in different ways for different categories of user such as general visitors, including the disabled, children, teachers, researchers, group visitors, museum supporters, event organizers, the press, etc. The presentation will give a history of the development of the website, originally initiated in 1995 several years before the museum actually opened. This helped establish the museum's presence throughout the world, particularly to the rowing community. Plans for the future, especially how the website fits into the museum's marketing strategy, will also be covered. Attendees should gain tips on how to produce a cost-effective website that is designed to be user-oriented. This paper presents a case study of the establishment of a brand new museum in the context of its associated website. The museum is unusual in that it established its website several years before the museum actually opened to the public. The museum is probably also unique in that its curator is married to its web designer, a computer scientist. This has meant that both have an understanding of the culture of these two rather disjointed worlds. River & Rowing Museum celebrates the traditions and environment of the River Thames, the international sport of rowing and the historic riverside community of Henley-on-Thames in England. Spacious and state-of-the-art, the specially commissioned building was designed by the award winning British architect, David Chipperfield. The museum was opened in August 1998 and is already an architectural landmark. "The museum's web site is a model of clarity and has been updated recently with new images of the galleries. The home page provides easy navigation for the whole site making it exceptionally easy to find the information on the museum's education facilities, shop and café. There are also plenty of links to other useful sites. Travel details are available should you wish to use the site to plan a visit." The current website has been produced at minimal cost, but is simple and effective in design, matching the minimalist design of the museum building itself. It has attracted over 66,000 virtual visitors so far (more than have visited the physical museum, although over a significantly longer period). The website is organized in a simple hierarchical manner. The first level is designed to present the museum in different ways for different categories of user such as general visitors, including the disabled, children, teachers, researchers, group visitors, museum supporters, event organizers, the press, etc. This paper gives a history of the development of the website, originally initiated in 1995 several years before the museum actually opened, both from the point of view of the museum's curator and the museum's website designer (who happen to be married to each other!). The early implementation of the website helped establish the museum's presence in a very cost-effective manner, especially to the rowing community, distributed throughout the world. Plans for the future, especially how the website fits into the museum's marketing strategy, are also covered. River and Rowing Museum is situated on the banks of the River Thames, in the historic town of Henley-on-Thames, just a short walk from the world famous Henley Royal Regatta headquarters, but it is not just a museum devoted to one sport. Its collections and exhibitions tell the story of the town and locality of Henley, interpret the geography, geology, ecology and social history of the river, and link the origins of rowing with the modern international sport. None of these topics had previously been covered by other existing museums and so we were about to break new ground in more ways than one. When I was appointed as the first member of staff in 1994, there was neither a building nor a collection. All that existed was a group of enthusiasts who were determined to create a museum that would link the history of the town and River Thames to the sport that has made Henley-on-Thames world famous. The challenge was to meet their high expectations by using a combination of modern design and technology with established museum values and professionalism. David Chipperfield had been appointed as architect for the museum in the early 1990's but construction did not commence until late 1994, when planning permission was granted and sufficient funds raised. He designed a minimalist building using a small palette of materials, concrete, steel, glass and oak and this established the design concepts which have been followed in the interior fit out of both the public areas - meeting room, café and shop and the exhibition galleries. The galleries were designed by museum specialists LAND Design Studio of London. While the building was under construction during 1995 to 1997, the curatorial staff, which now numbered four, were busy gathering together the exhibits for the galleries. As a new museum without an established collection, we not only had to arrange loans from other museums and institutions, we also needed to reach the individuals and organizations that had relevant information and material. Of course we used all the usual routes; local radio and newspapers, specialist interest magazines linked with the sport of rowing and the River Thames, talks to the Women's Institutes and Rotary Clubs, etc., but we also tried what was in 1994 a very new media � the World Wide Web. Our first web pages, hosted by the University of Oxford simply announced our intention to build a new museum and asked for help with some specific rowing queries. The pages were advertised in the rowing newsgroup; very quickly we started receiving both replies and requests for more information. Some of the queries were straight forward, "I think my grandfather rowed at Henley Royal Regatta / in the Oxford and Cambridge University Boat Race, can you confirm this...?" but others led to interesting stories and acquisitions for the growing collection. Our request for information about early rowing machines, originally made in 1995, has simply run and run. Rowing machines were originally used mainly by North American crews who were unable to train in boats during the winter due to freezing conditions on the local rivers and lakes. But they quickly became general exercise machines and some were even installed in the gymnasium of the Titanic. Hence it was no surprise that most of the replies to our original request for information came from this continent, but the number of replies amazed us. We now have an excellent collection of rowing machines including the original Concept A prototype, an important acquisition. We are still collecting, but these days it has to be pretty unusual for us not to have already acquired one of the same type. Like nearly every other museum, we are planning to put digital images of our collection and associated metadata on the web. As an independent museum we have always had to raise all our own funds. To date we have had no money from central or local government or from the UK National Lottery. The quality of our building and displays is due to the generosity of mainly local people, who felt that this was a worthwhile project. However we have not always had funds or staff available to carry out in depth cataloguing, while simultaneously preparing for our opening to the public. Now we are open, this has become our top curatorial priority and with a new computer catalogue system about to be installed I predict that our backlog will soon be reduced. We hope to be able to report on progress in due course. The success of the website in the very early days is probably attributable to the excellent links through the Virtual Library rowing and museums pages and from other rowing-related websites, which made it possible for people to find us on-line. The profile of one of our target groups, oarsmen and women, also helped. They were often young, attending universities or colleges where they had Internet access or in occupations where they used computers. This was before the days when every school and public library had computers installed. As the museum construction progressed the web pages became more numerous. Sketch designs of the building, and possible gallery interiors, were first seen by our virtual visitors long before the real building was completed. It was highly unusual to have a fully operational museum web site before we had opened the museum, but it seemed to be a very effective form of public relations for a small computer literate group. We were therefore very surprised to receive our first visitors, a year before we opened to the public. They were American tourists who had planned their itinerary from London to include Windsor, Henley and Oxford and naturally expected any museum with a website to be open to the public. We were only able to show them an empty building and our plans for the displays, but I do hope they will come back again one day. The museum first opened its doors to visitors at the end of August 1998 (Hirst, 1999). By this time the website had been completely redesigned, with actual photographs of the museum, links to other sites of interest (including a photographic tour of the Thames), and information about our facilities and opening hours. While you would think that, being married to our website designer, I would have no problem keeping everything up to date, this is not always the case. Like many others we have been caught out when I have forgotten to mention a change in opening time from 10 o�clock to 10.30 at weekends, or the end of a temporary exhibition. Sometimes the automatic links between sites on the web can also cause updating problems. A recent example we encountered was a local information site which had taken opening times from the previous year's printed leaflet and not updated our special millennium closure on New Year's Eve. An irate phone call was the first we knew of this error. It is sometimes difficult to convince people that you are not personally responsible for everything written about you on the web! On a more positive note, some of the best uses of the website are to give instant information. Our press releases are on-line as soon as any embargo allows. In the past year the museum has won awards for the architecture including The Royal Fine Art Commission Building of the Year for England, it was short-listed for the Royal Institute of British Architects (RIBA) Stirling Prize and received a Civic Trust Award. It is planned to expand the website further to provide information for teachers visiting with parties of school children. Now that every school has access to the Internet, the museum has decided not to spend money producing traditional printed packs of information for schools, which quickly become obsolete as the UK National Curriculum changes. Our plan is to put all the relevant information onto the website so that each teacher can make the selection required and print as many copies as they require. Most recently, River and Rowing Museum won the UK Museum of the Year Award that was presented in November 1999, almost exactly one year after the museum was officially opened by H.M. Queen Elizabeth II. This was the highlight of our first year of operation and represented acknowledgement of everyone's achievements to create a unique museum and associated website for both real and virtual visitors. 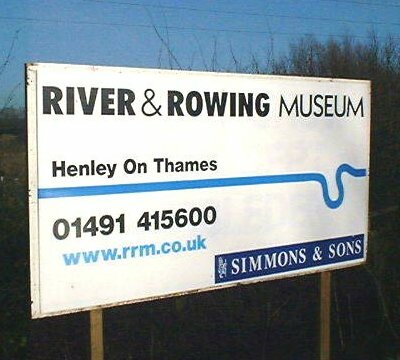 In 1994 my wife was appointed Director of the newly established River & Rowing Museum at Henley-on-Thames. At the time the museum had four objects in its collections (one out on loan!) and no building. Thus the museum was effectively a "virtual" museum at this point. This was the time when the Web was starting to make an impact in the academic world (Berners-Lee, 1999). The early graphical (and, importantly, freely available) browser Mosaic was installed at many academic sites, which was a marked improvement on the previous textual world of FTP (File Transfer Protocol) access with incantations known only to a limited cognoscenti. As an academic researcher at the Oxford University Computing Laboratory, I had the time to search the Internet for interesting material. With a wife in the museum world, I noticed that a handful of museums, mainly in the US, already had a museum website, normally installed due the availability of an enthusiastic individual. The Museum of Paleontology at the University of California, Berkeley stood out as a leading example at the time. I started to make a collection of hyperlinks to museums with on-line websites. Over the years, this developed into the Virtual Library museums pages (VLmp) now support by the International Council of Museums (ICOM) (Bowen, 1997a/b & 1999a). In parallel, I also developed the Virtual Library rowing pages, also part of the Virtual Library (http://www.vlib.org/) originally founded by Tim Berners-Lee who invented the World Wide Web. This provides links to rowing-related resources all over the world. Both VLmp and the rowing pages were by their very nature broad and international in scope. Of course I as an individual could not cover these huge areas in any great depth or in a comprehensive manner. However, the River & Rowing Museum provided an excellent case study in providing more depth for an individual museum in both areas. Initially the Oxford University Computing Laboratory, connected via the UK JANET academic network, hosted the museum's website. The museum itself had Internet access via a well-known early pioneering Internet Service Provider (ISP) in the UK, Demon. This gave them direct email access (via a telephone line). Thus the museum homepage could include electronic contact details for museum staff as well as more traditional contact information. It also emphasized the collecting interests of the museum by requesting historic rowing machines, now an important feature of its collections due to the offers that have resulted through early email contact via the website. The museum's website has featured news releases as they become available since its inception. Initially these were handled in an ad hoc way, and also posted to the rec.sports.rowing newsgroup where appropriate. This newsgroup was also used for general advertising of the museum's existence and its website. Using the newsgroup meant that a well-targeted readership with an interest in rowing could be kept involved of developments at minimal cost. Since the museum was not yet in existence in non-virtual form, it was felt important to give website visitors a feel for how the museum could look when completed. Thus the early museum website include architect's conceptual drawings of the museum building, virtual reality views of the inside of the building's main galleries, and also designer's drawings of the planned galleries. In addition, progress on the museum building was included. For example, views of the pile-driving necessary for the museum's foundations and to raise the ground floor well above the level of the River Thames� flood plain were included. The museum's first leaflet included the URL for the museum's website (the rather ungainly http://www.comlab.ox.ac.uk/archive/other/museums/rowing.html due to its host location), which was unusual for museums at this time, when even an email address might be considered advanced. This meant that local people could be informed of the museum's Internet presence via more traditional means. The museum's ISP also provided "free" web space as part of its package, so for a while the museum's website was also available under the URL http://www.henrrm.demon.co.uk/. However, this is a proprietary domain name owned by Demon over which the museum has no long-term ownership. Every additional URL associated with a museum introduces the problem of maintenance and of search engines finding the various URLs associated with a museum, some of which may be out of date. In addition, links from related sites are likely to remain for a long time to come, and perhaps cannot be updated since the original maintainer is no longer available for some reason (due to a change of job for example). Thus it is recommended that any existing URLs for a museum forward the virtual visitor to the latest URL in some way if at all possible. Web technology can allow this to be done automatically if set up correctly, or at least a manual link to the new site can be provided. For the River & Rowing Museum, there are still many external hyperlinks to the original site at Oxford that are outside the direct control of the museum. Thus this site now auto-forwards virtual visitors to the latest website location. The museum obtained a proper top-level domain name for a new site under http://www.museophile.sbu.ac.uk/rrm/, still hosted by the Demon ISP, but owned by the museum. Email addresses for museum staff now use this domain name too. Hopefully this URL and domain name can remain the standard web location for the museum for the foreseeable future. All printed publicity material, news releases, letterheads, etc., for the museum include this URL and the museum's generic email address of museum@rrm.co.uk. See Figure 2 for a prominently displayed billboard on the roadside advertising the museum, including its web address www.rrm.co.uk. Some thought has been put into the design of the new museum website, especially navigational aspects. The site has been designed very much with the user in mind. On the homepage, a number of the hyperlinks available are of a form that give a clue as to the type of visitor who is using the website. For example, links such as "Children", "Teachers" and "Researchers" are available. If these are followed then relevant material is presented in a form suitable for these classes of visitor. The children's pages are presented in a larger font and include more interactive features. The page for teachers is rather drier, but gives information on educational resources that the museum can provide for schools. At any point in navigating the website, the museum logo/name at the top of the web page may be selected to move one level up the hierarchy (except at the museum's main home page. The hierarchy is normally a maximum of two levels (occasionally three levels) deep so a maximum of two (occasionally three) hyperlink traversals is required to return to the museum homepage from any given web page on the website. The title of each page (normally displayed at the top of your browser) uses vertical bars before subtitles to give an indication of the current level in a well-structured manner. This was inspired by the New York Museum of Modern Art's excellent and minimalist website (Van Alstyne, 2000) which is very much in keeping with ethos of that museum and has won the Museums and Web conference's Best of the Web award. The museum building was designed by the minimalist architect, David Chipperfield, and the website attempts to follow a minimalist approach in its presentation. The web page backgrounds are white in general and graphics are used sparingly in the navigation pages, which helps with download speed when traversing the site. Fonts are set to be sans-serif for a more modern feel, both using the older <FONT FACE=" "> hypertext markup and the newer Cascading Style Sheets (CSS) which allows greater control of font size and other formatting features in HTML pages controlled from a single file (called "rrm.css") on the website. In general, all use of more recent web technology has been in a manner such that those with older browsers can still navigate and use the website even if some features are unavailable to them. There are a number of hidden files on the website that help control its use. A "robots.txt" file in the main directory is detected by most search engine robots and allows specific parts of the website to be excluded from being searched. This is typically used to prevent the "cgi-bin" (Common Gateway Interface) area from being searched since this area consists of programs rather than static web pages. On the River & Rowing museum website, an "images" directory holds most of the image files for the site as opposed to web pages, so this area is specifically excluded. The website has made use of student projects at the nearby University of Reading to produce on-line interactives using Java technology aimed especially at children. These would have cost thousands of dollars to produce commercially, but were made available to the museum at no financial cost. The interactives include a River Thames distance calculator and a lock display, similar to a physical interactive in the museum, where the user must guide a boat through a pair of lock gates and back successfully. The on-line version checks that the operations are undertaken in the correct sequence and includes suitable sound effects. Basic metadata markup is included on all web pages in the site. In particular, the standard "description" and "keywords" fields that are recognized by many search engines are included. If present, the description field is often used by search engines for the brief description normally included with entries returned by them. Otherwise the text at the beginning of the web page is used and sometimes this can be cut off rather awkwardly in mid sentence. The keywords field is useful for adding extra keywords that are not present in the body of the web page, but which could be used by a user searching for that page. The website continues to feature press releases. These are saved in HTML from the original Word document by the local public relations company Marbles and are then emailed as an attachment to the website maintainer. This rather plain HTML file is then automatically converted to another HTML file with the website's "look and feel", including a suitable navigation header logo, adding hyperlinks to a set of standard key phrases, etc. This is then downloaded to the museum's website using FTP (File Transfer Protocol). This means that press releases can be installed within the hour during a working day if required. This is especially effective for press released with an embargo date and time (for example, announcements for awards) since these can be made available on the website as soon as they are allowed to be generally available. The whole process could be totally automated, but this depends on the availability of a special email address for this purpose and there are security issues to consider. The museum is collaborating with the 24 Hour Museum (Butler, 1999), a newly established UK museum web portal (http://www.24hourmuseum.org.uk/). This has been set up by the UK MDA (Museum Documentation Association). It includes a searchable database of museums in the UK, with brief details and a hyperlink to the museum's own website if available. A number of museums, including the River & Rowing Museum, are participating in a pilot project to include even more internal hyperlinks to the museum under different categories. Participating museums maintain an on-line HTML format file on their website that includes a table of categories prescribed by the MDA, the relevant URL within the museum website and a brief description of the resource. For these pilot museums, the 24 Hour Museum processes this information and includes these extra hyperlinks within its database. Thus users can access information for these museums in a standard format. In addition, a picture of the museum is included. The 24 Hour Museum has undertaken a MORI poll of what information people are trying to find when they visit a museum website. The top items of information virtual visitors to UK museums require include opening times admission prices and details of special exhibitions. Direct links to these have now been added prominently to the homepage of the River & Rowing Museum's website. On the commercial side, information on the shop and café are available on-line. In particular, the museum is an associate of Amazon.co.uk (United Kingdom) and Amazon.com (USA) on-line bookstores. The museum receives a percentage of any on-line sales of books via the museum's website (specifically, books on the River Thames, the sport of rowing and the local area). So far the level of on-line sales has been low. Such initiatives require marketing to ensure success, and this is something the museum is considering as part of its overall marketing strategy for the future. In February 2000, a virtual tour of the museum was added to the website. Panoramic gallery views of up to 360 degrees were recorded using a set of overlapping photographs taken using a digital camera on a tripod. Software is now widely available that allows such series of photographs to be "stitched" together either automatically by the computer (reasonably successful for photographs with good overlap taken on a tripod) or by allowing the user to align matching points on adjacent photographs if the computer cannot do it automatically. The combined images can be saved either as large standard image files (e.g., in JPEG format) or as QuickTime VR movies. The museum use of QuickTime has been pioneered by the Hunterian Museum in Glasgow, Scotland (Devine & Welland, 2000). In particular, a tour of the Mackintosh House is available on-line. For an example of the results for the River & Rowing Museum, see Figure 3 which shows a 180 degreeview of the ceiling of the rowing gallery where a number of historic rowing boats are suspended upsidedown for viewing from beneath. The advantage of JPEG format is that it can be viewed on any modern standard web browser. It is also of reasonably high quality for the file size (which is still an issue for large images on the web, especially if the target viewers are mainly connected via standard telephone lines, as is likely to be the case for many virtual museum visitors). A disadvantage of JPEG for a 360 degree panorama is that there must be a vertical split in the image at some point in the view. This latter problem is overcome by the QuickTime format that allows the viewer to search arbitrarily to the left or right in the image, effectively spinning around as many times as desired in either direction. QuickTime viewers also allow the user to zoom in on an area of interest, and then out again as required. In addition, "hot spots" with hyperlinks to other images are possible. In fact, the Henley-on-Thames gallery at the museum includes an excellent virtual tour of the town and Henley Royal Regatta course with hyperlinks between various viewpoints. Currently this is not on-line, so you must visit the museum itself to see it. A disadvantage of the QuickTime format is that a special viewer (typically a web browser "plug-in") is required and this may not be present on all client computer systems. Although viewers for Windows and Apple systems can be downloaded free off the Internet and are available on many multimedia CD-ROMs, this is not as easy as it could be for "naïve" users. In addition, although the size of QuickTime files is reasonably efficient, for the highest quality (e.g., to allow zooming in on the image without too much degradation of quality) the files can become large. Small files are possible if a tradeoff of quality and/or image size is acceptable. This is something that still needs to be considered carefully for any potentially large image files that are to be placed on-line for general access via modems. Statistics on visitors are always of interest to museums, whether physical or virtual (Bowen, 1999b). Since the installation of the original museum website at the Oxford University Computing Laboratory, the numbers of on-line virtual visitors has been monitored. Over 65,000 visitors have accessed the site over the years. Initially the log files on the web server were used to glean statistics. A graphical counter based at the University of Reading has been used to record the number of virtual visitors each day since the establishment of the new website under http://www.museophile.sbu.ac.uk/rrm/. At the end of December 1999, links to two statistics collecting websites were included on the main homepage. NedStat provides basic information as a single web page, available at any time on-line. The eXTReMe Tracking website provides more comprehensive information available as a set of inter-linked web pages. Both resources work by placing a special fragment of HTML code on the web page to be monitored. This includes an image consisting of a small logo that is dynamically generated by the statistics site while also collecting relevant information about the client host name, the time, data, etc. In addition, this image acts as a hyperlink to the statistics website to allow the currently available statistics information to be viewed at any time (Internet and web server permitting). The same statistics packages have been add to the Virtual Library museums pages. Comparing the two can help in seeing how the virtual visitors to the museum's website differ from the "average" virtual museum visitor that is likely to be represented more nearly by the VLmp statistics. Tables 1 and 2 compare the visits recorded by day of the week, time of day, country and continent. Both sets of statistics show a slight decrease in access at the weekend, but this is far less pronounced than the early days of the web when weekend access was about half that during the week for VLmp, probably because more people had access via work then. Nowadays there is much more ready access at home as well. The hourly accesses show an increase in virtual visitors during the afternoon (GMT). This is the time that North American and European daytime accesses overlap and these two continents form by far the largest part of the Internet globally, as can be seen from the breakdown of accesses by continent. Domain names for client hosts accessing page provide information on the country of origin. Accesses to the River & River Museum site are not surprisingly skewed towards UK visitors compared to VLmp. However, both have accesses from all around the world, although obviously VLmp has far more virtual visitors. From 14 December 1999 to 3 February 2000, the River & Rowing Museum received accesses from 50 different top-level domains (i.e., approximately 50 countries) and VLmp received accesses from 104 domains. A significant number of accesses (almost 40%) are from Internet sites that are not properly registered. This means that the domain cannot be assessed in these cases. Given these statistics, many of the limitations of web browsing that were an issue even a year or two ago concerning browser compatibility and availability of features such as good color display are now much less of an issue. A statistic that is difficult to assess automatically is access speed, but it can still be assumed that most people access the Internet via a telephone line and modem, and thus file size for web pages, graphics and other multimedia facilities on-line is a continuing limitation and concern. In addition, eXTReMe Tracking provides information on the source of accesses. Both the museum and VLmp received about 44% of accesses via "referrals" (e.g., from links on other websites, search engines, etc.). The museum receives about 75% of its referred accesses via links from other websites and about 25% from search engines. Of these, Excite provides by far the highest number of referrals at about 53%, with Altavista second at about 13%. The most popular keywords that leads to a search engine referral are "rowing" and "Thames" at around 18% each. Also significant are "river" at 14% and "Henley" at 8%. It is probable that the words "River Thames" are used in combination. Given that these subjects essentially cover the area of interest for the museum, it is gratifying that virtual visitors searching for these keywords are finding their way to the museum's website. On the other hand, VLmp has a significantly higher percentage of website referrals at 92%. This is likely to be because of the established nature of VLmp that means there are many links to it from other websites around the world. Search engines only account for 7% of referred accesses. In this case, MSN Search gives the highest number of search engine referrals at 54%, with Yahoo second at 22% and Infoseek third at 8%. The highest keyword used for searching and finding VLmp is, not surprisingly, "museums" at 22%, with "virtual" second at 11%, "museum" third at 9%, "library" fourth at 6% and "art" fifth at 5%. Probably a significant number of searches are for "virtual library". Both curator and designer are happy with the way the museum's website has developed so far. Currently, areas that are lacking and could do with expansion and development in the future include educational material, funding raising activities, collection database resources and commercial aspects (e.g., e-commerce for the museum shop). Information on rowing, the River Thames and Henley is maintained and linked from the museum, including many external links to other resources. Until now these have been located at the University of Oxford and the University of Reading. It is planned that these resources will be moved onto the museum's own website. The 24 Hour Museum has recently started an initiative to improve accessibility of educational resources on UK museum websites, and the museum intends to participate in this. The museum is also considering its overall marketing strategy and it is hoped that the website can be developed in line with this. It may well be that parts of the website will be developed by other web design companies as it expands. The possibilities for even more on-line interactive multimedia learning � ideally in a collaborative environment allowing interaction between museum visitors and museum staff on-line � are likely to increase (Bowen & Houghton, 1999). In the immediate future, Java seems like a useful technology for this, but implementation will depend on experienced Internet software developers and researchers (Fuentes & Troya 1999). The web is an ever-changing arena and the museum aims to keep up to date with developments. Building and then maintaining a website is a constant battle to ensure that information is not outdated (Angus, 2000). In particular, information on opening times, prices, temporary exhibitions are ephemeral in nature and must be monitored to ensure that the website contains correct information on these aspects. These are areas that many virtual visitors expect to be able to access on-line, and also expect to be up to date on-line. Web information on temporary exhibitions enables virtual exhibitions to be developed in parallel with the physical counterpart and also to remain in perpetuity since the cost of virtual space even over a significant time is negligible compared to the cost of development. This is something in which the Museum of the History of Science in Oxford excels (Bowen, Bennett & Johnson 1998; Bowen, Bennett & Morrison 1997). It is hoped that the River & Rowing Museum can produce similarly spectacular on-line exhibitions in due course. Currently a special exhibition on the 20th century British artist John Piper (who lived near Henley-on-Thames) entitled "John Piper: Master of Diversity" is being held at the museum (Wortley, 2000). It has been decided to make some of his lesser-known art works available on-line with the permission of his family. The museum is planning a collections database and once this is implemented, a subset of this information could usefully be placed on-line with direct searching by virtual visitors. A problem with commercial databases is the large sums charged for the licensing of on-line access. Museums without large resources could be well advised to aim for use of freely available database software such as MySQL under the Linux operating system for use on-line. Some museums are certainly embracing web technology in interesting ways, both individually (Bowen, 2000) and as a community (Bowen, 1999c). The Internet has traditionally been very US-centric, but this is gradually changing as telecommunications throughout the world improves (Cohen, 1999). However, it should be remembered we are still at a relatively early stage in the development of the Internet. Compare, for example, the early days of radio when there was little regulation (Hargittai, 2000). As the web increases in size, data mining of information will be increasingly important and difficult (Chakkrabarti et al., 1999). The next generation of web search engines, such as Google (http://www.google.com/), are likely to use the structure of the web increasingly to discover important web sites (those with many links to them) and major portals (those with many links from them). Automatic revision of a website's structure depending on the popularity of pages within the site could be a useful way of increasing the effectiveness of individual sites. Weaving the web of the future will be an ever-challenging goal of both individual museums such as the River & Rowing Museum as well as on-line museum communities and portals just as the 24 Hour Museum. Both museum curators and web technologists need to collaborate to ensure that museums use this new medium effectively in the 21st century, both educationally and commercially. The statistical information for the River & Rowing Museum and Virtual Library museums pages websites are provided by NedStat (Compass Interactive BV) and eXTReMe Tracking. Both provide a free on-line service for which the museum is very grateful. The University of Reading has also provided support over the years. In particular, final year students in the Department of Computer Science have developed on-line interactives for the website, including most recently an excellent river lock simulation Java applet by James Pascoe. Angus, J. (2000). Building a Web site, Museum International, 52(1), 17�21, January�March. Cybernetics, modernism and pleasure in www.moma.orgBerners-Lee, T. (1999). Weaving the Web. London: Orion Business Books. Bowen, J. P. (1997a). The World Wide Web and the Virtual Library museums pages. European Review: Interdisciplinary Journal of the Academia Europaea. 5(1), 89�104, January. Bowen, J. P. (1997b). The Virtual Library museums pages (VLmp): Whence and Whither? In D. Bearman & J. Trant (eds. ), Museums and the Web, 1997: Selected Papers, pages 9�25, Pittsburgh: Archives & Museum Informatics. Bowen, J. P. (1999a). VLmp: The Virtual Library museums pages. ICOM News: Newsletter of the International Council of Museums, 52(1&2), 9. Bowen, J. P. (1999b). Time for renovations: A survey of museum web sites. In D. Bearman & J. Trant (eds. ), Museums and the Web 1999: Selected papers from an international conference, New Orleans, USA, 11�14 March 1999, pages 163�172, Pittsburgh: Archives & Museum Informatics. Bowen, J. P. (1999c). Museums and the Internet (1), Museum International, 51(4), 3�41, October�December. See Only Connect!, pages 4�7. Bowen, J. P. (2000). Museums and the Internet (2), Museum International, 52(1), 3�41, January�March. See The Virtual Museum, pages 4�7. Bowen, J. P., Bennett, J. & Johnson, J. (1998). Virtual Visits to Virtual Museums. In J. Trant & D. Bearman (eds. ), Proc. Museums and the Web 1998, Toronto, Canada, 22�25 April 1998. CD-ROM, Archives & Museum Informatics, 5501 Walnut Street, Suite 203, Pittsburgh, Pennsylvania 15232-2311, USA, 1998. Bowen, J. P., Bennett, J. & Morrison, I. (1997). Working the Web. Museums Journal, 97(11), 28�29, November. Bowen, J. P. & Houghton, M. K. (1999). Networked Multi-user and Multimedia Environments for Learning and Collaboration. Technical Report, RUCS/1999/TR/013/A, Department of Computer Science, The University of Reading, UK, November. Butler, S. (1999). Webwatch. Heritage Development, 06.99, 52, June. Chakrabarti, S., Dom, B. E., Kumar, S. R., Raghavan, P., Rajagopalan, S., Tomkins, A., Gibson, D. & Kleinberg, J. (1999). Mining the web's link structure. IEEE Computer, 32(8), 60�67, August. Cohen, R.B. (1999). Moving toward a non-U.S.-centric international Internet. Communications of the ACM, 42(6), 37�40, June. Devine,,J. & Welland, R. (2000). Cultural computing: exploiting interactive digital media Cultural computing: exploting in, Museum International, 52(1), 32�35, January�March. Fuentes, F. & Troya, J. M. (1999). A Java framework for web-based multimedia and collaborative applications. IEEE Internet Computing, 3(2), 55�64, March/April. Garofalakis, J., Kappos, P. & Mourloukos, D. (1999). Web site optimization using page popularity. IEEE Internet Computing, 3(4), 22�29, July/August. Hargittai, E. (2000). Radio's lessons for the Internet. Communications of the ACM, 43(1), 51�57, January. Hirst, T. (1999). Making a voyage of discovery. Museums Journal, 99(11), 27, May. Van Alstyne, G. (2000). Cybernetics, modernism and pleasure in www.moma.org. Museum International, 52(1), 36�41, January�March. Wortley, L. (2000). John Piper: Master of Diversity. Henley-on-Thames: River & Rowing Museum.